We are nearly at the end of 2017, it has definitely been a mixed year with both great things happening but also some not so nice things too. As I try to be positive I'm not going to focus on the negatives and instead talk about some of the best things that happened this year. One of the best things that happened this year was that I met Elle in "real life" after chatting to her for just under half a year of speaking through texts and messages. We met through a YouTube collaboration that was organised by a fellow YouTuber and we started chatting after, which turned into a great friendship. 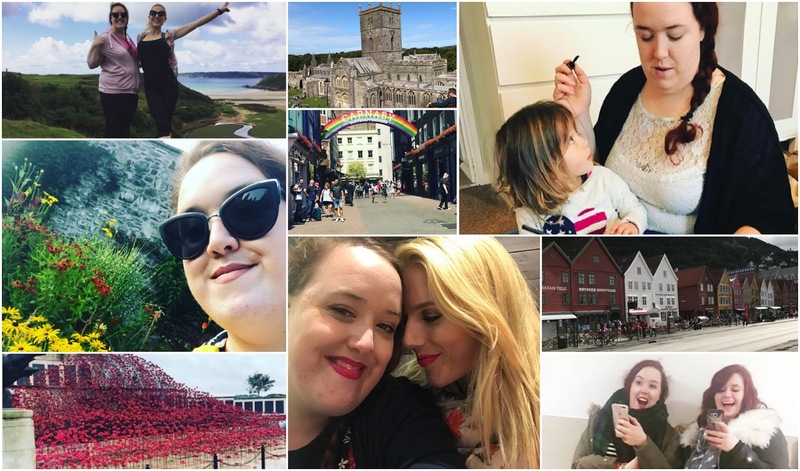 In 2017, like I said we met up for the first time ever in Wales where she lives and from then our friendship has gone from strength to strength. I've gained a great friend and I'm so happy to have met her and I'm proud to call her a friend. More time spent with Elle in 2018 is needed I think. 2017 also saw me go on a big trip. Last year I spent 4 weeks travelling around New Zealand and the Cook Island. This year my big trip was a two week trip to Norway. We spent two weeks on a boat traveling the coast of Norway from Bergen to Kirknes and back to Bergen again. It was an amazing trip full of amazing views, gorgeous Huskies and new favourite places. I would definitely like to return in a few years time to see more of this gorgeous country. London also seemed to hold a great pull over me this year. In January, I spent a weekend with an old blogging friend, Lisa. We spent our afternoon enjoying afternoon tea in Selfridges and then the evening watching a musical, which ended up being one of my favourites of the year. Since then I have made multiple other trips to London to see A LOT of shows in the West End. Thanks to the creation of my own theatre vlogging channel, The Theatre Necessities, I have made so many trips to see a good variety of things all of which I reviewed for my channel. Finally, like always, I have gone away for various weekends and holidays in the UK with my family. I always love exploring new places in this country of ours, which has such varying countrysides and gorgeous beach side villages. All explored in my comfy trainers, bright coloured rain coats and my dog at my side, it's something I never tire off and I know it something I will continue with in the new year. What were your best bits of 2017?